What is OneLink and how will it benefit me? OneLink is a script-based solution that allows you to monetise your international traffic from the United Kingdom, Canada, Italy, France, Spain, Germany, and Japan. When visitors on your web pages click on a text link to buy a product on Amazon, OneLink will redirect your international visitors to their local or nearest Amazon marketplace as this is where they have an account, can see pricing in their local currency and have reasonable, if not free shipping costs. OneLink allows for the best user experience by creating a seamless redirect for your international visitors, allowing them the ability to complete their purchases within their local or nearest Amazon store. This leads to a better shopping experience for your customers, and better conversion rates for you. How do I start using OneLink? Getting started is easy and requires a one-time setup. But first, you must sign up to the US Associates Program. You can sign up here and then check out the detailed Integration Guide for OneLink. Why will Global Reporting excite me? We've made it easier for you to view reports across countries where you have linked Associates IDs together for OneLink. 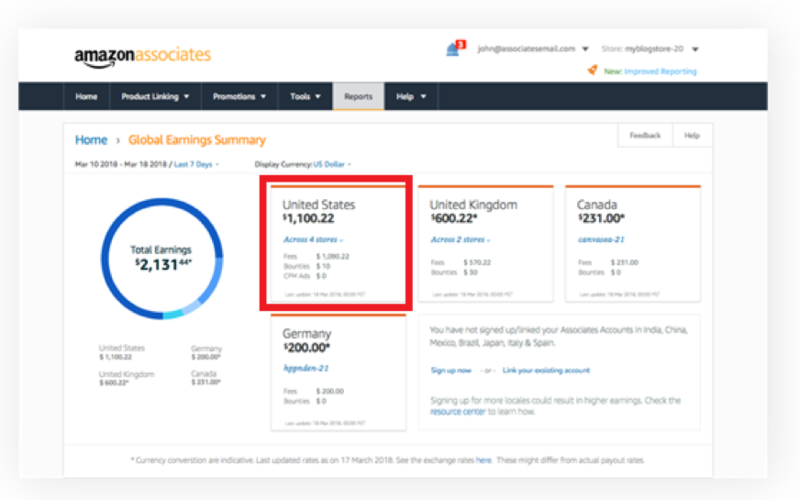 Until now you had to log into each country's portal, look at reports individually, and possibly manually convert all the earnings numbers into your preferred currency. You can now log into your home portal and view a summary of your global OneLink performance in your preferred display currency. What do Global Reports look like? 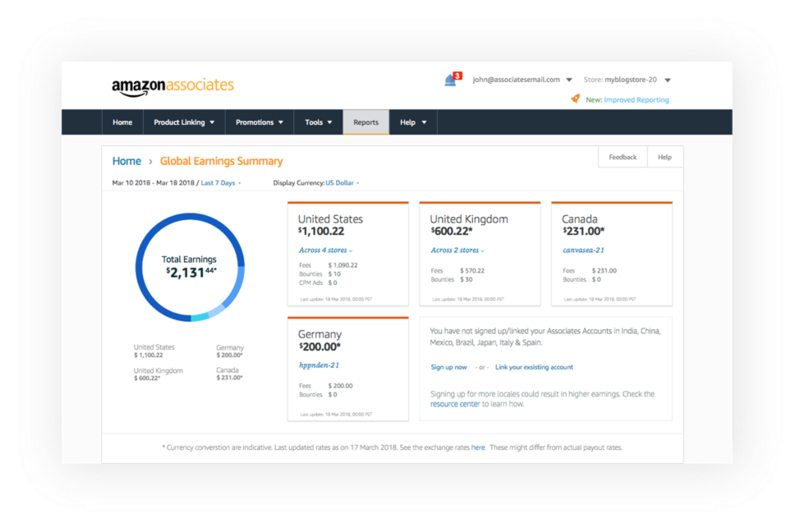 This page has two parts, a summary view of your global earnings which is a total of earnings across all stores that you have mapped for OneLink and a per country summary of the earnings across all stores in that country. When you load this page for the first time, you will see the global earnings summary on the left of the screen in the default currency for the portal (for example, this will show in USD in the US portal) and each country's summary on the right will show in the default currency for that country (for example, the UK earnings would show in GBP). If you prefer to view this information in a different currency, you can select your preferred display currency from the drop down and all earnings information on the Global Reports will be refreshed in your selected currency. The next time you log in, we will remember your display preferences. I'm on the Global Reporting page, and I want to look at a specific country's report. How do I do that? You can click on any country's "tile" to view that country's reports, without ever needing to leave the portal you are on. From the detailed country view you can also click back to the global reports page. How do I link Associates IDs? If you are an existing OneLink customer, you don’t need to do anything, we will automatically show you the summary of your earnings across all linked stores on this page. If you want to sign up for OneLink and link your Associates IDs, log into the US Associate Central, click the "Tools" menu and then select "Link My Stores". I have selected my display currency as USD, does this mean I will receive payments in USD for all my Associate IDs? No, the display currency is only a convenience service offered to you so you don’t have to manually convert all the different currencies. You will still receive payments as you do today.